The patella sits at the front of the knee and acts as a fulcrum, increasing the moment arm of the quadriceps pull at the front of the knee to increase the efficiency and power of knee extension. The patella also helps guide the extensor mechanism, keeping it lined up in the middle of the front of the knee. Finally, the back of the patella is covered in a layer of articular cartilage, which makes the contact surfaces very low friction, reducing wear rates. The shape of the patella is complex and the number and direction of the various surrounding soft tissue attachments (muscles/tendons, ligaments, retinaculae) is also complex, and there can be a lot of variation between individuals. One of the factors about the patella that can vary significantly between individuals is the height of the patella, in reference to the level of the knee joint line (the tibiofemoral articulation). If the patella is sitting too high (equivalent to the patellar tendon being too long) then this is called patella alta. If the patella is sitting too low (i.e. a short patellar tendon) then this is patella baja (sometimes referred to as patella infera). It is very difficult to make an accurate clinical assessment of the exact height and position of the patella with respect to the deeper structures of the knee just from looking at or feeling the front of the knee. Part of any full assessment of a knee joint is to get X-rays. X-ray reports (from radiologists) rarely give all that much real detail about the exact appearances of a knee — any decent proper knee specialist will need to actually see the images themselves (not just a report), in order to make a proper detailed assessment. 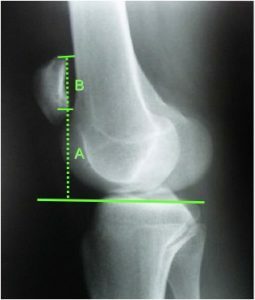 On X-rays, there are various ways of measuring the height of the patella. Probably the best is the Blackburne-Peel index as shown below. Increased contact pressures on the articular surface of the patella. 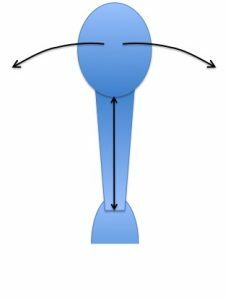 As the knee bends, the V-shaped patella glides into a reciprocal V-shaped groove in the front of the femur, called the trochlear groove. This helps guide the patella into the midline and keeps the patella stable in the middle of the knee as it moves up and down. However, when the knee is straight the patella sits above this groove, and the patella only enters the trochlear groove at about 20 or 30 degrees of knee flexion. Until the patella does actually engage into the trochlear groove, it has the potential to slide sideways, laterally. Hence most patellar dislocations happen when the lower leg is rotated externally (outwards) and the knee is bent outwards (laterally, into valgus) on a knee that is just slightly bent. 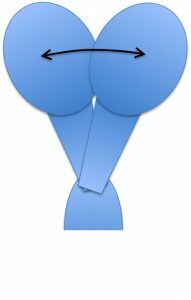 If the patella is sitting to high (patella alta) then the patella will only engage in the trochlear groove later in the flexion arc (i.e. when the knee is more bent, greater than the normal 20 to 30 degrees). This means that the patella has the potential to be less stable for a greater percentage of time. Furthermore, it is also believed that with patella alta, the fact that the patella tendon is actually longer means that there is a greater ‘windscreen wiper’ effect – i.e. 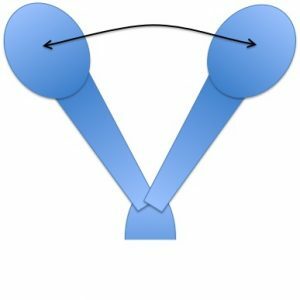 the shorter the patellar tendon the more restricted the potential side-to-side movement of the patella will be, whereas the longer the patellar tendon, the longer the radius of the arc of potential movement, and the more side-to-side movement there can be. 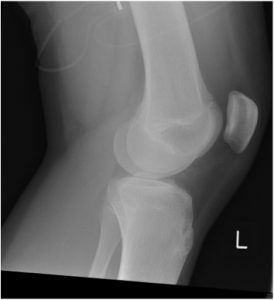 A short patellar tendon / low patella. A long patellar tendon / high patella. Increased patellar mobility with patella alta. A relatively recent and excellent study from Belgium, from Bellemans (a very well known and respected Professor of Orthopaedics) and his team, looked at the contact pressures in the patellofemoral joint in loaded cadaveric knees. They found conclusively that patella alta alters the patellofemoral joint loading patterns and increases the patellofemoral contact pressures. This study has proved what most of us suspected anyway – which is that patella alta puts increased pressures on the kneecap. This can lead to anterior knee pain, an increased rate of wear and tear, and damage to the articular cartilage on the back of the patella, eventually potentially leading to patellofemoral arthritis. If a patient has significant patella alta that is causing specific problems (instability and/or patellofemoral wear/pain) then this can be treated effectively by surgically shifting the patella downwards by however far is necessary to put it into the normal position. This is achieved with an operation called a tibial tuberosity advancement osteotomy. Tibial tuberosity advancement osteotomy is performed under a general anaesthetic with a 1-night post-operative stay in hospital. An incision is made at the front of the knee, directly over the tibial tuberosity. 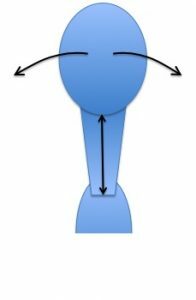 The tibial tuberosity (with the patellar tendon) is cut from the front of the tibia and shifted downwards by however many millimeters is appropriate (as measured in advance from X-rays). 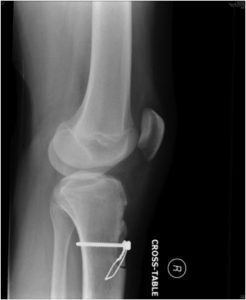 The bone of the tibial tuberosity is then fixed back into place in its new position using a screw and a steel wire band. Post-operatively, patients are normally kept minimal weight-bearing with 2 crutches and with their knee in a brace for the first couple of weeks. Then, weight-bearing status is gradually increased. The knee is checked with X-rays, and when the healing of the bone appears to be well under way (normally by about 6 weeks) then the brace and subsequently the crutches are discarded. Then, gym work is commenced, including exercises such as the exercise bike. Most patients are pretty much over the operation by 3+ months post-op. Tibial tuberosity advancement osteotomy works well at stabilising the patella and reducing patellofemoral contact pressures, pain and cartilage damage. However, it is important to appreciate that it will not reverse whatever cartilage damage might already be present. Tibial tuberosity advancement osteotomy is normally combined with simultaneous knee arthroscopy, so that the whole of the inside of the knee can be checked and in particular, the surfaces of the patellofemoral joint inspected and probed. Any articular cartilage damage can then be tidied up and treated at the same time. Patella Baja (sometimes called ‘Patella Infera’) is the opposite of patella alta. With patella baja the patella sits too low down (which is the same as the patellar tendon being too short). This leads to significantly increased patellofemoral contact pressures and very commonly leads to anterior knee pain, increased wear and tear to the articular cartilage, and eventually to articular cartilage damage and then patellofemoral arthritis. Some people are simply born with patella baja. Other potential causes include scarring and contraction of the patellar tendon after specific surgical procedures such as patellar tendon harvest for ACL reconstruction, or total knee replacement surgery. Unfortunately, there are no effective surgical procedures available to treat/cure/reverse patella baja, and treatment effectively consists simply of activity modification (particularly avoiding squats, lunges, heavy weights and running/impact) and symptomatic relief (physiotherapy, anti-inflammatories etc).